The Chrysler 200 Convertible is Chrysler’s most affordable brand-model, and is the Sebring’s successor. Its sleek two-door shape is aerodynamic, sporty, and oozes class. Buyers can choose from fabric or steel roof, and the interior is packed with impressive features such as heated seats, Bluetooth, and a premium audio system with a 6.5 inch touchscreen. 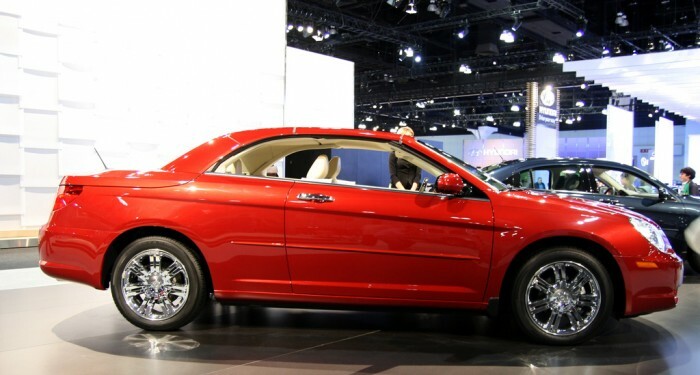 The Chrysler 200 sedan was introduced in December 2010 as a 2011 model year, and the little brother to the Chrysler 300. The Convertible version followed shortly after, becoming available for purchase in early 2011. The name change (from Sebring to 200) has helped the automaker distance the new generation from its predecessor and more closely relate the new 200 to the 300, Chrysler’s flagship car. The first generation 200 was short-lived, and the 2014 model year brings with it a new generation. The new 2015 Chrysler 200 was revealed to the public at the 2014 North American International Auto Show in Detroit on January 13, 2014. The all-new 200 features Chrysler’s Compact US Wide platform, updates to performance, and more upgraded features that come standard. The updated 200 Convertible reflects the new “face” of the Chrysler brand, including enhanced interior and exterior design and an exceptional driving experience. The Chrysler 200 Convertible was ranked the “Most American Made” convertible by The Kogod Made in America Auto Index in 2013.